"With the help of God small things grow"
Bandon (/ˈbæn.dən/; Irish: Droichead na Bandan) is a town in County Cork, Ireland. It lies on the River Bandon between two hills. The name in Irish means Bridge of the Bandon, a reference to the origin of the town as a crossing-point on the river. In 2004 Bandon celebrated its quatercentenary. 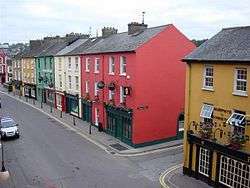 The town, sometimes called the Gateway to West Cork, had a population of 6,640 at the 2011 census. In September 1588, at the start of the Plantation of Munster, Phane Beecher of London acquired, as Undertaker, the seignory of Castlemahon. It was in this seignory that the town of Bandon was formed in 1604 by Phane Beecher's son and heir Henry Beecher, together with other English settlers John Shipward, William Newce and John Archdeacon. The original settlers in Beecher's seignory came from various locations in England. Originally the town proper was inhabited solely by Protestants, as a by-law had been passed stating "That no Roman Catholic be permitted to reside in the town". A protective wall extended for about a mile around the town. Written on the gates of Bandon at this time was a warning "Entrance to Jew, Turk or Atheist; any man except a Papist". A response was scrawled under the sign noting: "The man who wrote this wrote it well, for the same thing is writ on the gates of hell." Buildings sprang up on both sides of the river and over time a series of bridges linked both settlements. Like other towns in Cork it benefitted greatly from the patronage of Richard Boyle, 1st Earl of Cork, although he was not, as he liked to claim, its "founder". In 1689 it was the scene of a clash between Jacobite and Williamite forces during the War of the Two Kings. After an uprising by Protestant inhabitants who expelled the Irish Army garrison, a larger force under Justin MacCarthy arrived and retook the town. Sir John Moore, later leader of the British Army, who was killed in the Peninsular War at Coruña in Spain in 1809, was governor of the town in 1798. In the 19th century, the town grew as a leading industrial centre which included brewing, tanning, distilling, corn and cotton milling. The now closed Allman's Distillery produced at one point over 600,000 gallons of whiskey annually. The industrial revolution in the 1800s and the advent of the railways had a profound effect on the socioeconomic and cultural ecosystem of the area. Local weaving operations could not compete with mass-produced cheap imports. Major General Arthur Ernest Percival was commander of the British garrison in Bandon in 1920–21 during the Irish War of Independence. He was subsequently the commanding officer of the British troops who surrendered Singapore to the Japanese forces in 1941. In 1945 he was invited by Douglas MacArthur to witness the surrender of Japanese forces in Tokyo in 1945 which ended the Second World War. Irish army leader Michael Collins was killed in an ambush at Béal na Bláth, about 9.6 km (6.0 mi) outside Bandon. 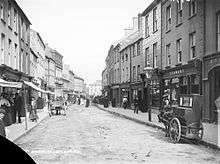 Between 1911 and 1926, the non-Catholic population of Bandon dropped from 688 (22% of the population) to 375 (13% of the population), a decline of 45.5%. Peter Hart argued in The IRA and its Enemies (1998) that during the Irish War of Independence, Bandon's Protestant population, which was largely unionist, suffered from Irish Republican Army (IRA) reprisals. In particular, ten Protestant men were shot over 27–29 April 1922 (two months before the start of the Civil War), "because they were Protestant." an exception to this rule was in the Bandon area where there were many Protestant farmers who gave information. Although the Intelligence Officer of the area was exceptionally experienced and although the troops were most active it proved almost impossible to protect those brave men, many of whom were murdered while almost all the remainder suffered grave material loss. Murphy therefore concluded in a 1998 review of Hart's research, "the IRA killings in the Bandon area were motivated by political and not sectarian considerations". He amended this in 2005 to "Possibly, military considerations, rather than political, would have been a more fitting way to describe the reason for the IRA response to those who informed." In 2013 Bandon Mayor Gillian Coughlan described a song about these historical events by Professor David Fitzpatrick of TCD as "insulting to the memory of people who fought and to people who died". Castle Bernard, the seat of Lord Bandon, was also burned in the Irish War of Independence. Bandon Summer Fest is a family orientated festival run by a volunteer committee held over the August Bank Holiday weekend. The Bandon Music Festival takes place every June Bank Holiday weekend. In 2009 acts included Mick Flannery, Mundy, The Flaws and The Hogan Band. In 2010, Saturday night's headliners were Jack L and his band who were supported by Tupelo. Sunday night was joint headlined by both Fred and The Delerentos. The Bandon Festival of Lights took place on 1 December 2007. This event saw the illumination of the brand new state-of-the-art Christmas Lights. Bandon has a twin city agreement with Bandon, Oregon in the United States. That city was founded in 1873 by Lord George Bennet, a native of the Irish Bandon who named the American one after it, and who is known especially for having introduced gorse into the US ecology with some disastrous results. Graham Norton the BBC 1 chat show host lived in Bandon and attended Bandon Grammar School. His mother still resides there. Nicholas Brady, celebrated poet, noted for the Tate and Brady collaboration on a new version of the Psalms; born in Bandon in 1659, died in England 1726. George Bennett was born in Bandon in 1822 and graduated from Trinity College, Dublin with degrees in Arts and Law. His history of Bandon, which was released for public sale in 1869, has been a great source of information for this article. He went to Oregon in 1873 and founded a town which he named Bandon. Henry Gosnold, Chief Justice of Munster and friend of Francis Bacon, spent much of a very long life in Bandon, of which he became a burgess in 1612, and probably died there c.1650. Attiwell Wood (c.1728-1784), leading barrister and member of the Irish House of Commons, came from an old Bandon family. Author Margaret Wolfe Hungerford, who wrote numerous Victorian era novels, lived in Bandon until her death of typhoid fever on 24 Jan 1897. Dr James Murphy was born in Bandon in 1844. He devoted a large part of his career to the study of political history and economics. In 1919 he was invited to Buckingham Palace to give a talk to leading surgeons on a new method of amputation. Eugene O'Keefe (1827–1913), a brewer and businessman, emigrated to Toronto in and established the O'Keefe Brewery, which would later be bought by the Carling Brewery. O'Keefe was a philanthropist to Catholic institutions. Cornelius O'Sullivan, the 'founder of the science of bio-chemistry', was born in Bandon in 1842 and in 1866 he was appointed assistant brewer and chemist to Bass & Co. He later became the head brewer in 1894. He died in 1907 and was buried in Ballymodan graveyard. Sir George Strickland Kingston, who emigrated to Australia and became a prominent civil engineer, architect and politician, was born in Bandon in 1807. William J. Herlihy born 1818 and his son Timothy J. Herlihy born 1857, Dean of the Quartermasters of the Fall River Steamship Line. Robert Baldwin Sullivan, second mayor of Toronto (1834–1839). Brian Crowley, Fianna Fáil MEP for the South (European Parliament constituency) constituency. Graham Dwyer, was born in nearby Crossmahon and grew up in the town of Bandon, where he attended Hamilton High School. Dwyer was convicted in 2015 of the murder of Dublin social worker Elaine O'Hara. The case and trial was arguably the most high profile in the history of the state. Bandon Tidy Towns is a group of volunteers who meet up on Tuesday evenings at 7pm at Hartes Car Park from April until the end of the season. The group is actively seeking new volunteers to help with planting etc. Bandon Rugby Football Club were the inaugural winners of the Munster Senior Rugby Cup in when they defeated Garryowen Football Club in the final in 1886. Bandon AFC play at the Town Park on the Macroom Road. The club has active men's, juveniles and ladies teams. The Senior Men's team play in the Munster Senior League Senior Premier Division. Bandon GAA are affiliated to the Carbery GAA division of Cork GAA. Bandon Tennis Club has three courts at the Bandon Golf Club. The club has active men's, ladies and mixed teams that participate in leagues throughout the year. The children's section of the club is also vibrant with members on the Junior Irish Tennis Squad. Bandon also boasts a fabulous 18-hole Golf course on the grounds of CastleBernard. There are four secondary schools in Bandon. One of these, Bandon Grammar School, is a fee paying Church of Ireland-ethos boarding school. The other schools include Hamilton High School, St. Brogan's, and Coláiste na Toirbhirte (formerly known as Presentation Sisters College). Bandon Grammar School and St. Brogan's are both mixed schools, Hamilton High School is a boys only Catholic school, and Coláiste na Toirbhirte is a girls only school. Hamilton High is now situated in a building near where the grammar school originally was before moving across the river to its current location in the 1950s. In Harry Potter and The Chamber of Secrets, Gilderoy Lockhart claims to have defeated the 'Bandon Banshee'. ↑ "Census 2006 – Volume 1 – Population Classified by Area" (PDF). Central Statistics Office Census 2006 Reports. Central Statistics Office Ireland. April 2007. Archived from the original (PDF) on 7 June 2011. Retrieved 2011-06-12. ↑ Census for post 1821 figures. ↑ "NISRA – Northern Ireland Statistics and Research Agency (c) 2013". Nisranew.nisra.gov.uk. 2010-09-27. Archived from the original on 17 February 2012. Retrieved 2014-02-03. ↑ Mokyr, Joel; O Grada, Cormac (November 1984). "New Developments in Irish Population History, 1700–1850". The Economic History Review. Volume. 37 (4): 473–488. doi:10.1111/j.1468-0289.1984.tb00344.x. ↑ "Evangelical Magazine and Missionary Chronicle". Volume 24. 1816. Retrieved 2013-09-16. ↑ "The Church Under Attack". ↑ "An Amazing Past". Bandon.ie. Retrieved 24 December 2011. ↑ A Record of the Rebellion in Ireland in 1920–1921, Jeudwine Papers, 72/8212, Imperial War Museum. ↑ Lecturer Ballad insults victims of Dunmanway, Justine McCarthy, Sunday Times, 17 February 2013. ↑ "The Opinion | opinion magazine". Bandonopinion.com. Retrieved 2014-02-03. ↑ "Coláiste na Toirbhirte – Presentation College, Bandon, Co. Cork". presbandon.ie. Retrieved 6 June 2016. ↑ "Bandon Parish". Archived from the original on 10 September 2011. Retrieved 7 October 2011. Wikisource has the text of the 1911 Encyclopædia Britannica article Bandon. 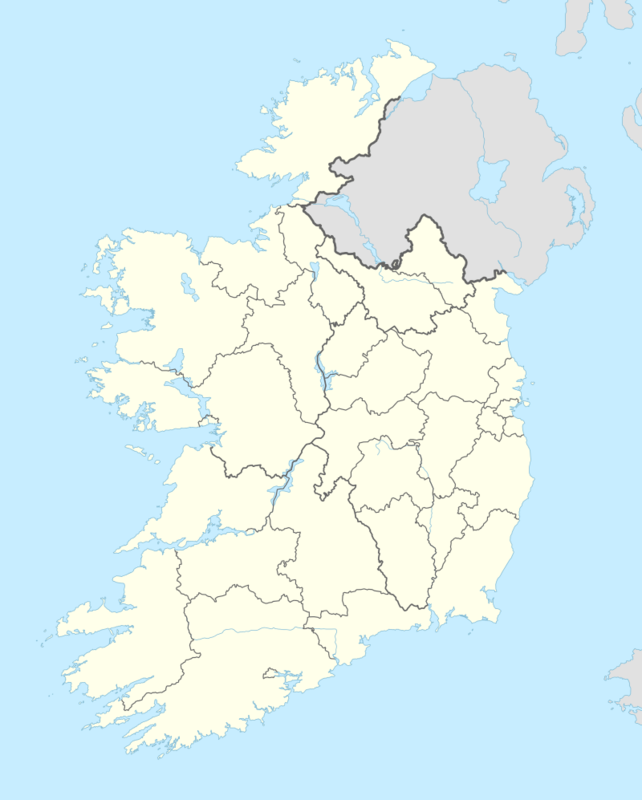 Wikimedia Commons has media related to Bandon, County Cork.